Ask an expert about robots, space, and space robots right now! By now, you've probably seen RoboSimian — the four-limbed, ape-inspired robot built by the Jet Propulsion Lab — in action at least once (and if you haven't, seriously, check it out now). Today, we've got Brett Kennedy, who leads the RoboSimian team at JPL, here to answer all our questions about robots, space, and robots in space! 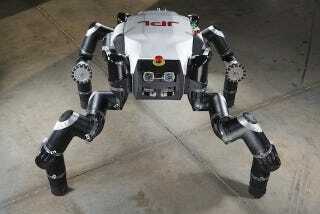 Meet Robosimian, the ape-inspired robot! Brett Kennedy has been interested in robots, space, and especially space robots, since he was at least eight years old. (Anime can be a powerful force for good, he tells us.) He has degrees in mechanical engineering and robotics from Berkeley and Stanford, and he designed the world's very first "limbed" robot, the Lemur. You may also know him from his work on the Curiosity rover (he led the team that built its robotic arm), or perhaps from the recent DARPA competition, where RoboSimian, which could one day play a role in disaster relief, was named a finalist. Brett will be joining us at 11:30 a.m. (PST), so start asking him your questions now about RoboSimian, the future of robotics, and, of course, robots in space!